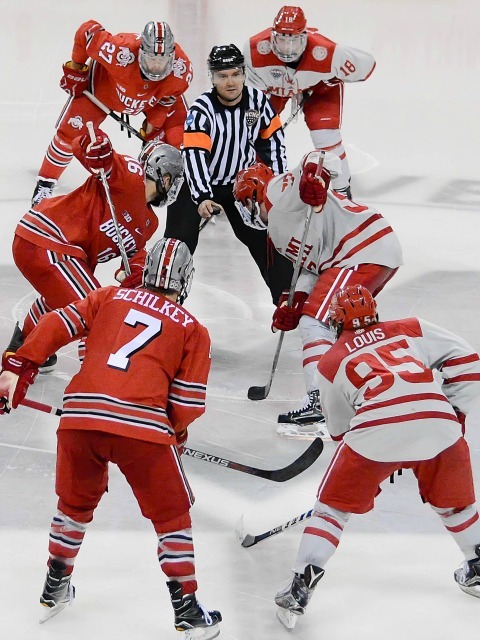 Images from the Ohio State at Miami game played on Oct. 15, 2016 at Cady Arena in Oxford, Ohio. All photos by Cathy Lachmann/BoB. Austin Czarnik became the 28th former Miamian to log an NHL game when he made his debut for the Boston Bruins in Columbus on Thursday. Czarnik, tied for fifth on the RedHawks’ all-time points leaderboard with 169 and second in team history with 123 assists, logged 15 minutes in his first game in the world’s premier hockey league. The center from Washington, Mich., scored 20 goals and picked up 41 helpers in his first full pro season with AHL Providence in 2015-16. 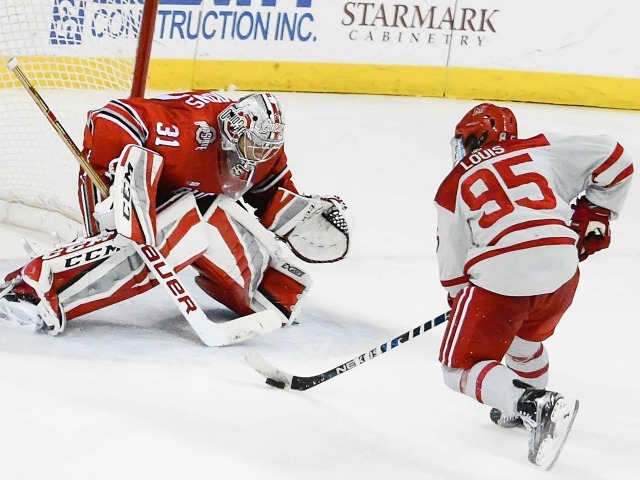 He turned professional immediately following his senior season at Miami in March of 2015 and notched two assists in three games for the P-Bruins. 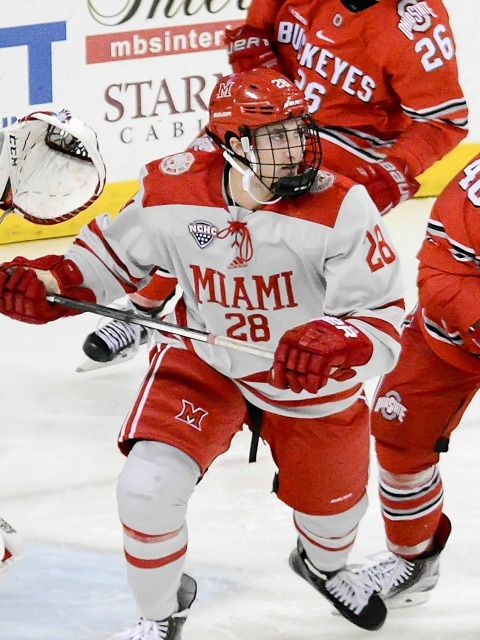 Czarnik was Miami’s captain his final two seasons and tallied at least 37 points in all four of his seasons in Oxford. 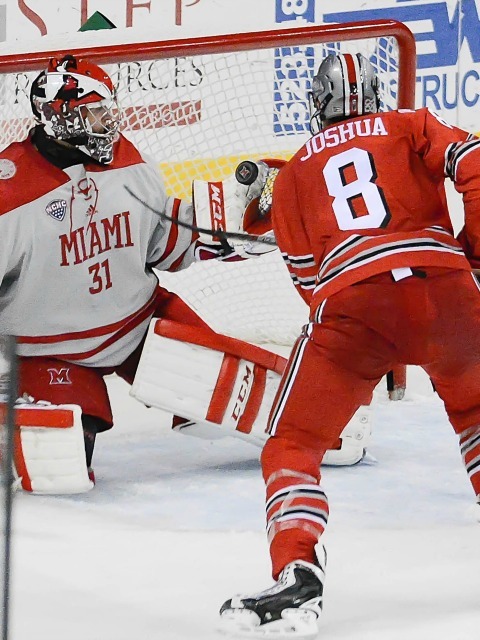 Miami’s first weekend of the season would have to be considered a success, as the RedHawks split at No. 10 Providence, losing the opener, 4-3 but winning the finale, 2-1. Granted the Friars lost several key players from their dominant team of the past two seasons, but keep in mind that PC scored seven goals in Oxford last year in the first game when these teams met and Miami salvaged a tie in the Saturday contest. And not to be repetitive, but the 2015-16 edition of MU did not have 14 freshmen. Especially with the win coming in the Saturday game, Miami has to have momentum heading into a five-game homestand, with very winnable games on tap. The occasional disappointment is still expected this season as half of the team becomes acclimated to the physicality and speed of the Division I game, but a split in a hostile environment against a national power is a fine start and sets an outstanding tone heading into the rest of the season. A look at how those position battles are shaking out…although unfortunately viewing this game was not in the cards on this end. BoB will get a much better look at everyone with five straight at Cady Arena in the next 15 days. – Coaches are always going to say there are constantly positional battles for lineup spots, and based on Week 1 it looks like two defense slots are still being decided as well as one forward spot. Coach Enrico Blasi’s typical MO has been to let competitions play out the first half of the season and then solidify his lineup more in January. Positional battles are healthy within a team, although the obvious downside is that qualified players sometimes sit. But here is a look at those competitions. 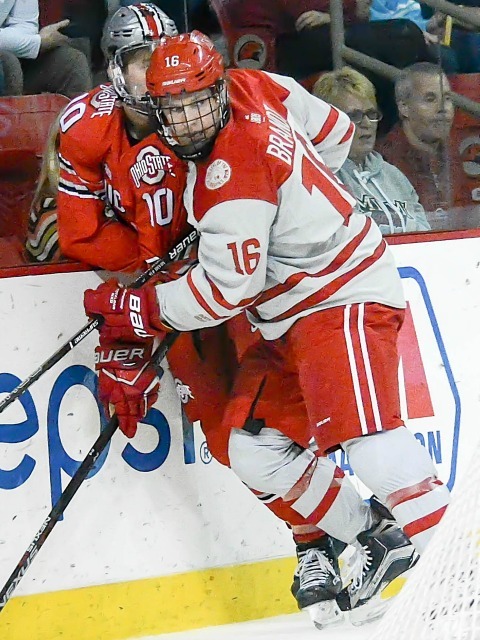 Forwards – Alex Alger and Willie Knierim both played one game at PC. Alger played on Friday and went minus-1 with no shots or points. Knierim dressed for Game 2 and did not have a shot or a point and took one minor penalty. 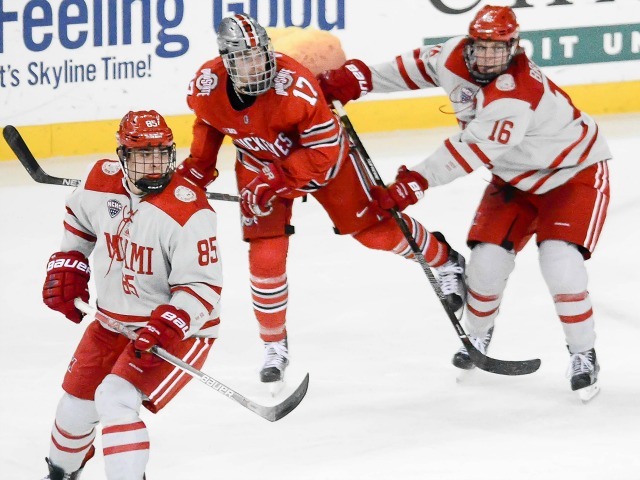 Alger is more experienced and smaller while Knierim is a wide-bodied true freshman who is expected to get better as his Miami career progresses. Returning forwards that played both games (7) were Josh Melnick, Kiefer Sherwood, Anthony Louis, Conor Lemirande, Justin Greenberg, Zach LaValle and Ryan Siroky. Gordie Green (photo by Cathy Lachmann). 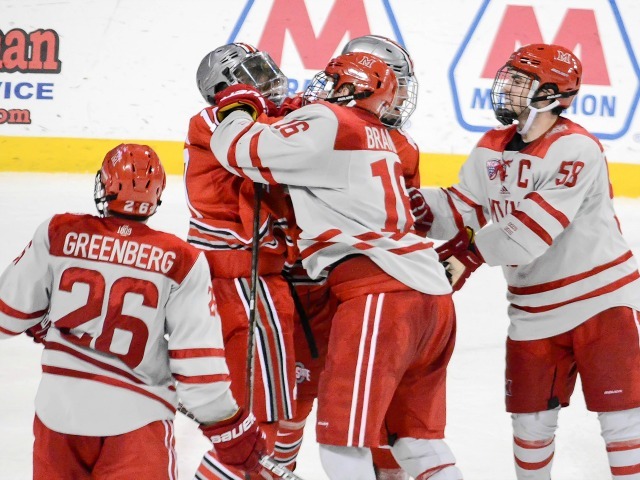 The four freshmen that were in the lineup for Friday and Saturday were Gordie Green (two assists), Carson Meyer (one goal), Carter Johnson (one assist) and Karch Bachman (Florida Panthers draft pick). This team has only 14 forwards, so with Christian Mohs injured, Alger and Knierim will likely vie for that final lineup spot, although Colin Sullivan could move up from his traditional defense spot. 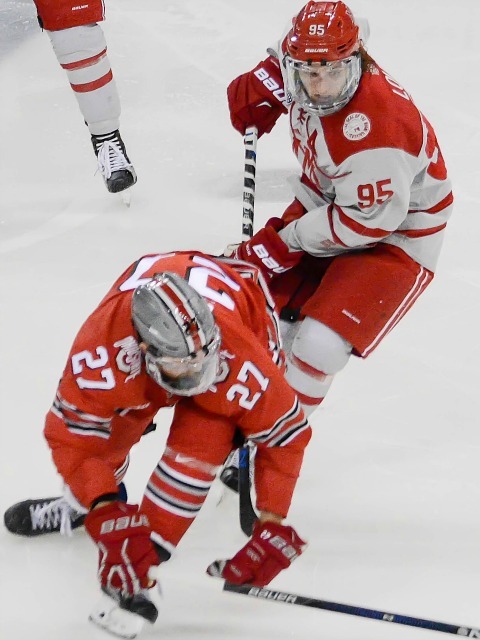 Defense – Jared Brandt is the lone freshman to hit the ice in both games last week, and he had a zero rating with one penalty and two SOG. Louie Belpedio, Scott Dornbrock and Grant Hutton, to no one’s surprise, were also dressed for both games. Assuming Brandt will be a mainstay on the blue line, that leaves four defensemen for two spots. Grant Frederic, Bryce Hatten, Chaz Switzer and Sullivan all played one game opening weekend. Frederic is one of the favorite to play each night although he went minus-3 with two penalties on Friday. 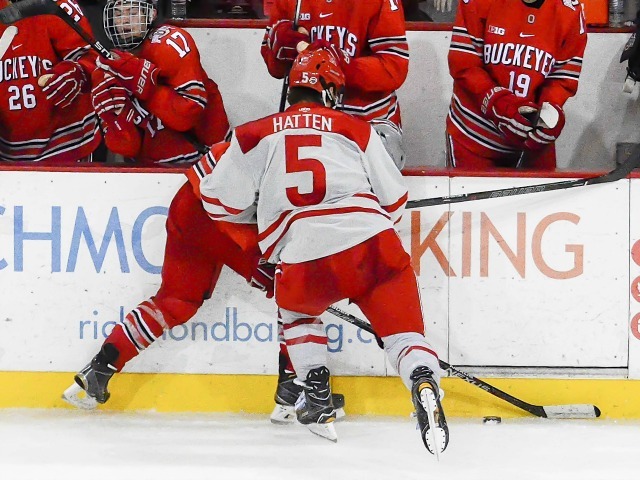 Hatten is still working his way into game shape after an injury-plagued 2015-16 and took a major penalty in his start. Switzer went minus-1 and Sullivan, who is a senior and was solid for Miami last season, had a zero rating and did not go to the box. Goaltending – We’ve seen Jeff & Eff, Cody & Connor and Jay & McKay, and since Jeff Zatkoff’s ridiculous junior season in 2007-08, the backup goalie has played at least 16 games. But Ryan Larkin logged all 119 minutes in the opening weekend, going 1-1-2.52 with a .906 save percentage. At some point during this homestand it’s likely that we’ll see backup Chase Munroe, who posted a 2.22 GAA in the NAHL last season. 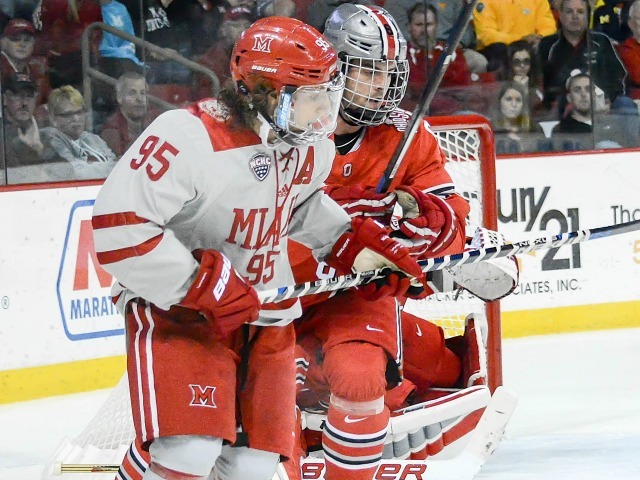 WHO: Miami RedHawks (0-0-0) at No. 10 Providence Friars (0-0-0). WHERE: Schneider Center, Providence, R.I.
NOTES: Providence has had the better of Miami in recent years, with its NCAA Tournament-opening victory over the RedHawks in Dunkin Donuts Area up the street from this building in 2015 and a 1-0-1 mark in Oxford last season. The Friars went on to win the NCAA championship two seasons ago and were eliminated by Minnesota-Duluth in double overtime in the first round of the NCAAs this spring. Miami did salvage a tie in the series finale vs. PC last season after getting pounded by the Friars, 7-3 in the opener. Overall, the RedHawks are 4-6-3 vs. Providence and 1-2-1 in this building, with their lone win coming in 1998. Their last visit to Schneider Arena was in 2013 and resulted in a loss and a tie. The Friars’ top three scorers and four of their top five from 2015-16 are gone, and the top returning threats for PC are defenseman Jake Walman and forward Brian Pinho, both of whom finished with 28 points. Pinho and Erik Foley are the lone 15-plus points producers back, so offense may not be a strength of this Providence team after multiple seasons of scoring dominance. But the Friars are bringing in a pair of drafted forwards in Kasper Bjorkqvist, a second round pick of Pittsburgh, and Minnesota fourth rounder Brandon Duhaime. On defense, in addition to Walman, Buffalo draftee Anthony Florentino and Josh Monk lead the list of returning starters. Monk had two goals and 11 assists and Florentino scored five times and notched seven helpers. Steven Ruggiero – selected by Anaheim – also returns to the Providence blue line, and sophomore Vincent Desharnais was picked by Edmonton this past season. In net, last season’s starter, Nick Ellis, turned pro after three seasons with PC, leaving the reins to Montreal draft pick sophomore Brandon Hawkey. Possessing a fantastic hockey name, Hawkey played just five games in 2015-16 but went 2-0 with a 1.67 goals-against average and a .940 save percentage. Brandon Leahy is back between the pipes after playing one game last season, and Kris Carlson comes in as a freshman out of the NAHL. With a huge freshman contingent, this will be a very tough road test for Miami, but long road trips can aid in the bonding process, and the team could be better off down the road because of it. 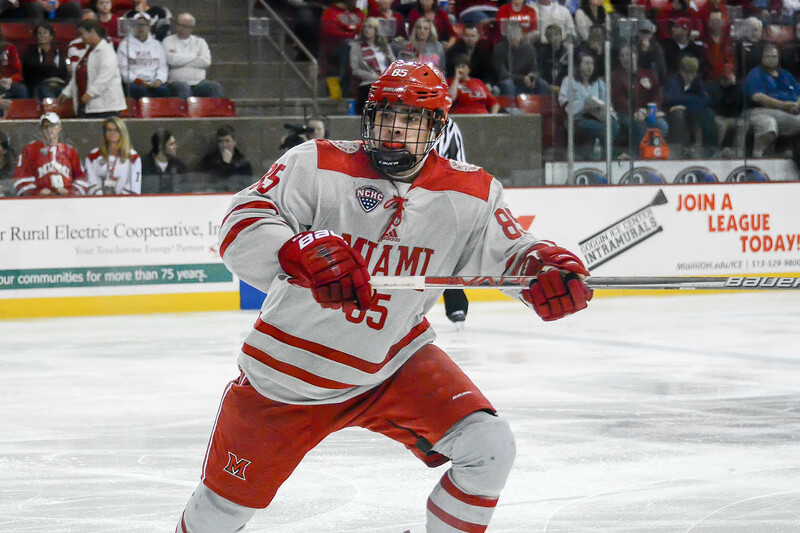 Miami opens its season on Friday, and when it takes the ice it will feature its first defenseman captain since 2012-13 in junior Louie Belpedio. 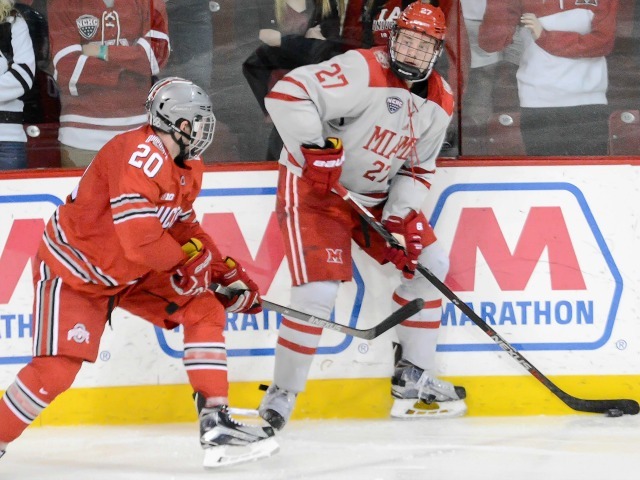 Belpedio, an assistant last season who netted four goals and dished for 13 assists to lead all RedHawks blueliners in points with 17 last season, is just the second defenseman to hold that title since Cady Arena opened. Steven Spinell (2012-13) is the other). 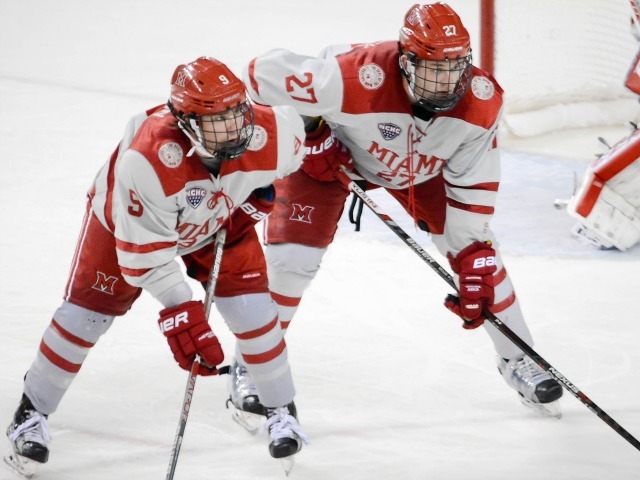 Captaincy is a cumbersome role at Miami, and the transition was not easy for the past two captains. 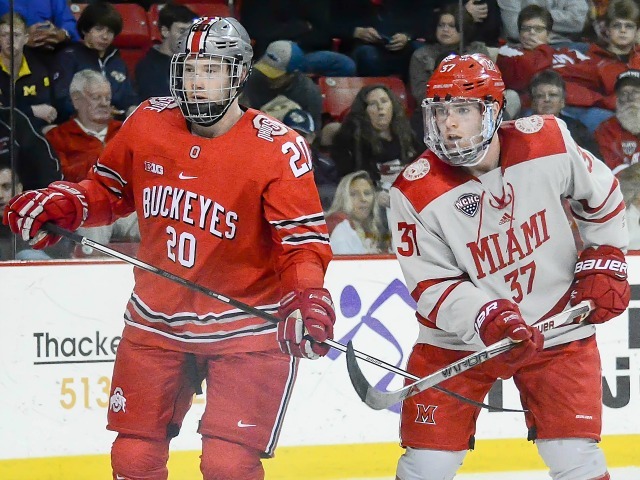 Austin Czarnik took over in 2013-14 after having never been in that capacity at any level and it took time for him to learn leadership off the ice, and Sean Kuraly earned the ‘C’ in the summer of 2015 but struggled on the ice the first half of last season. Belpedio said the high number of freshmen could have made his job even more difficult, but the players came in over the summer to work out rather than when school started, making their transition into their first regular season smoother. 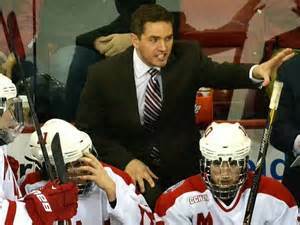 Coach Enrico Blasi said that Belpedio having been an assistant last season had aided in his transition to wearing the ‘C’. 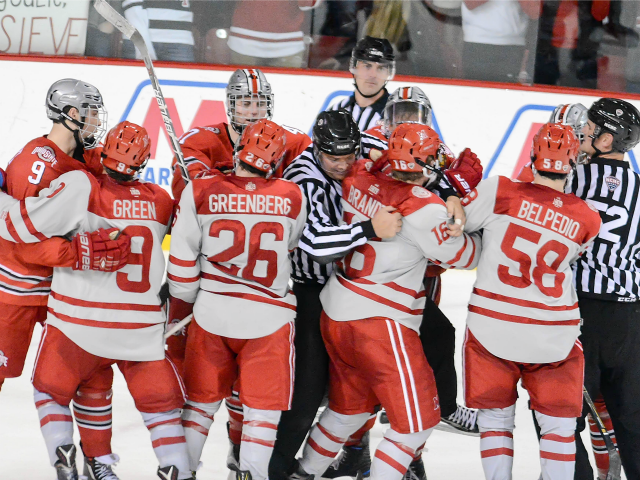 Josh Melnick (right) and Louis Belpedio (left) celebrate an OT goal by Belpedio (photo by Cathy Lachmann). Also earning assistant captain status are senior forward Anthony Louis as well as junior forward Conor Lemirande and sophomores forward Josh Melnick and defenseman Grant Hutton. It’s unusual for a sophomore to earn a letter, much less for a team that will have half its team entering their first season in Oxford. Melnick called Belpedio a great fit for captaincy. “Throughout the whole spring last season and the summer this year, he’s been a great leader both on and off the ice, showing the new guys the way and pulling everyone along with him as well as saying the right things, keeping high spirits,” Melnick said. With 14 freshmen, Blasi said the only way to cope with that is for them to play games and gain experience. Opening night is Friday in Providence, which went 1-0-1 against the RedHawks in Oxford last season and knocked them out of the 2015 NCAA Tournament. Blog of Brotherhood takes a quick glance at each position. First-round pick Jack Roslovic turned pro this off-season after tying for the team lead in points last season with 26 and standout Sean Kuraly graduated, but two of Miami’s other 25-point producers return this fall in Melnick and Louis. 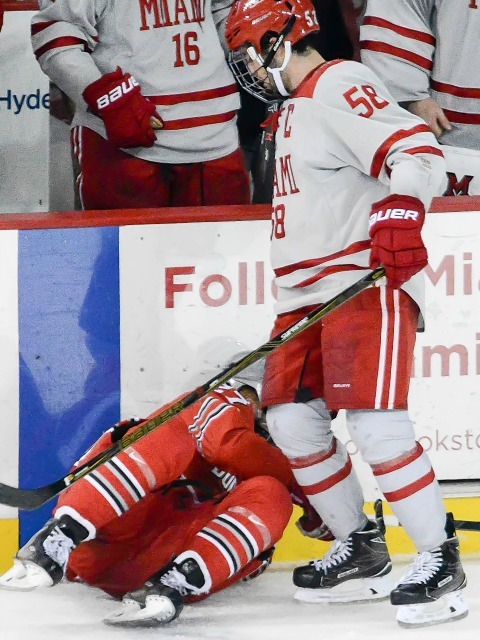 The RedHawks averaged just 2.39 goals per game last season, and although it was an exhibition, MU took a step forward in that department by lighting the lamp eight times vs. Waterloo on Saturday. Melnick did everything at a high level in 2015-16 and went 9-16-25. Kiefer Sherwood, also a sophomore, had an outstanding second half and finished with 11 markers and seven assists and Miami hopefully has a serious scoring duo for the next three seasons. Louis finished with 11 goals as well in addition to 15 helpers and needs just 13 points to become the next member of the RedHawks’ 100-point club. No other returning player had more than 10 points last season, although freshman Carson Meyer pumped in 32 goals in his first full season in the USHL in 2015-16 and Karch Bachman, a Florida Panthers draftee, scored twice in the exhibition as well as Alex Alger. 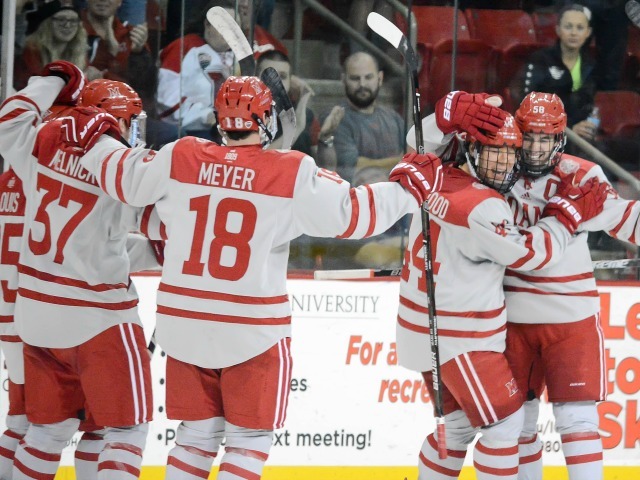 Gordie Green and Willie Knierim are also expected to contrinute right away after successful seasons in Dubuque, with Green playing more of a playmaker role while Knierim is a true freshman wide body who will hopefully continue to get better as he develops into his 6-feet-3 frame. Overall Miami has seven newcomers at forward, and add four sophomores for a total of 11 with one year of experience or less. 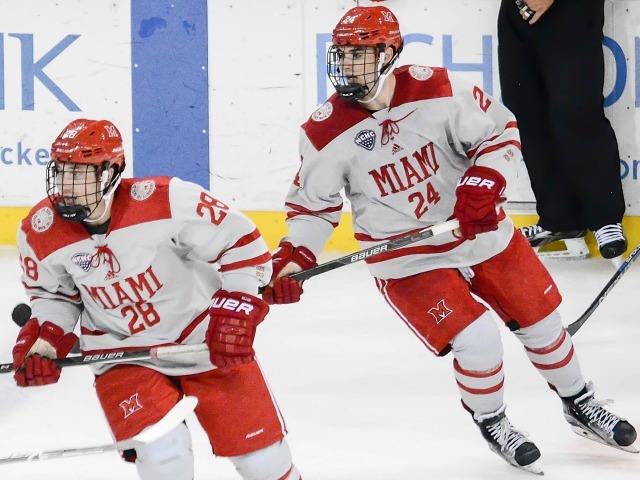 Out are standout Matthew Caito and shutdown blueliners Chris Joyaux and Taylor Richart, which means Miami must replace half of its starting D-corps from 2015-16. But obviously Belpedio will anchor the blue line, and senior Colin Sullivan, junior Scott Dornbrock and Hutton return and should be solid in their end. Belpedio played 34 of 36 games and went 4-13-17, Dornbrock also logged 34 games and picked up six assists, Hutton dished for five helpers in 35 games and Sullivan scored a goal in 15 contests. Assuming those four start each night, that leaves two spots for four freshmen. 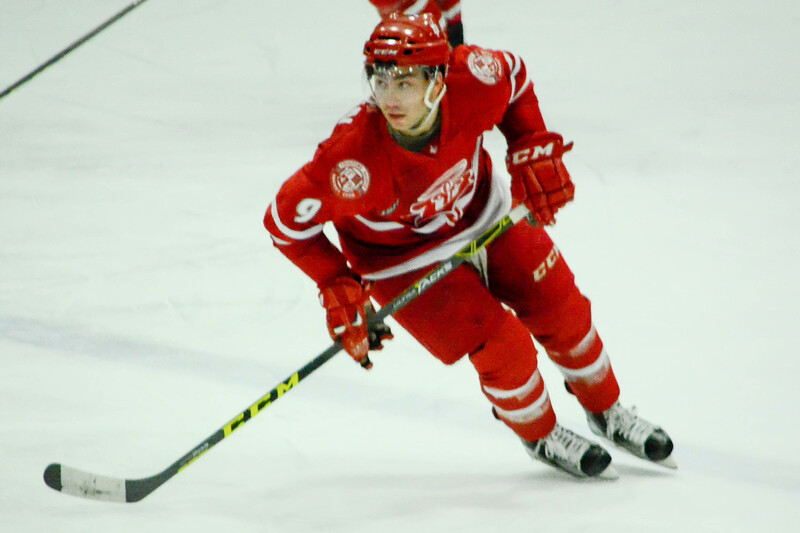 Grant Frederic is one of the favorites to land ample playing time, having captained USHL Green Bay last season. Frederic, a 6-feet-3 St. Louis native whose brother was drafted in the first round by Boston this June, went 2-12-14 with a plus-20 rating for the Gamblers and has a reputation as a big hitter. Chaz Switzer, Jared Brandt and Bryce Hatten are the other three rookie blueliners. 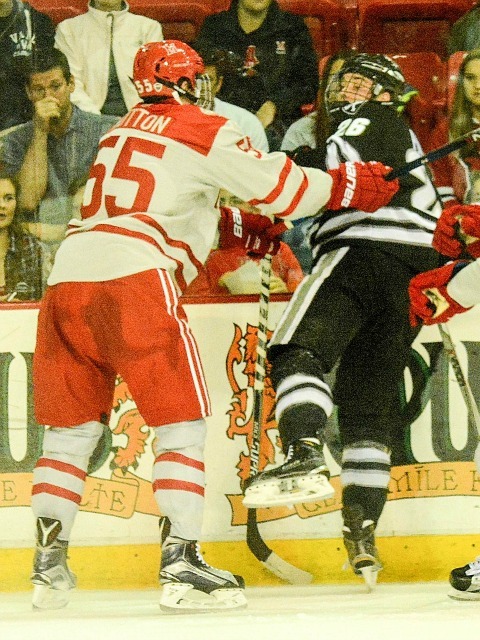 Hatten was injured much of last season and may still need time in 2016-17 to return to 100 percent. Hatten and Switzer are 19 while Brandt turns 21 later this month. 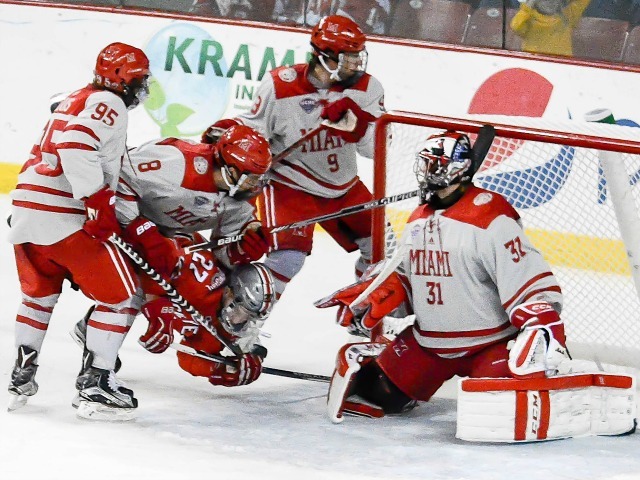 The rawest position for Miami, the four RedHawks goalies have logged a total of nine minutes, and the netminder who did play in a game – Evan McCarthy – is out with an undisclosed injury. Ryan Larkin played the first two periods of the exhibition, which is interesting because in the past when Miami has had split situations – which it has had most of the past decade – the top two goalies have played 30 minutes each. 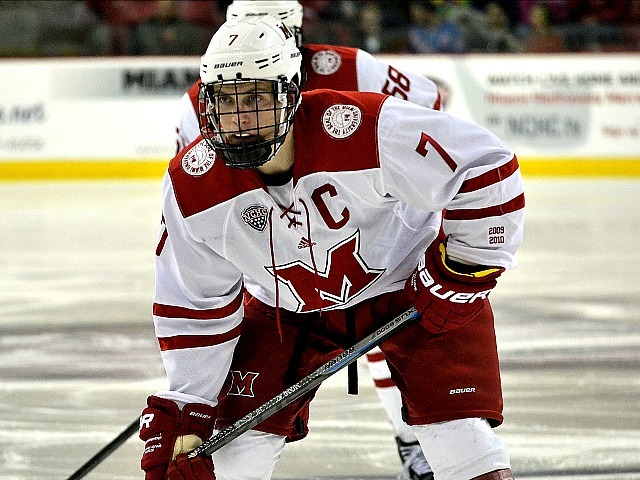 Larkin, the cousin of Detroit Red Wings forward Dylan Larkin, was limited to four games last year because of injury and went 3-1-2.13 with a .917 save percentage. He had a .919 save percentage in 2014-15 in his only full season in the USHL. Chase Munroe stopped all nine shots he faced in the third period on Saturday and finished 19-15-2.22-.912 with Minnesota of the NAHL in 2015-16. 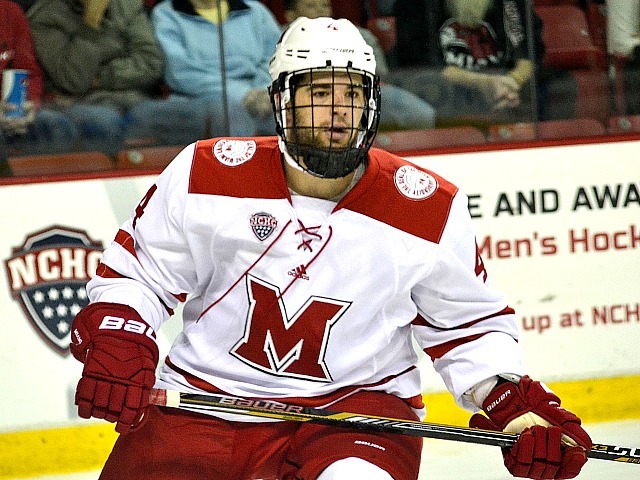 Munroe has plenty of juniors experience, coming to Oxford at age 21 having played three full seasons in the NAHL. The late addition to the team is Andrew Masters, who is also 21 and dominated in the Ontario Junior Hockey League, posting a .934 save percentage last season. Western Michigan University is the final stop in our NCHC Snapshot series. The Broncos finished seventh in the conference in 2015-16. WMU dropped three of four with Miami while finishing 5-18-1 – a .202 winning percentage in NCHC play and 8-25-3 (.229). COACH: Andy Murray (6th season 81-84-27 – .421 winning percentage). 2015-16 RECORD: 8-25-3 (5-18-1 in NCHC, 7th place in the league). 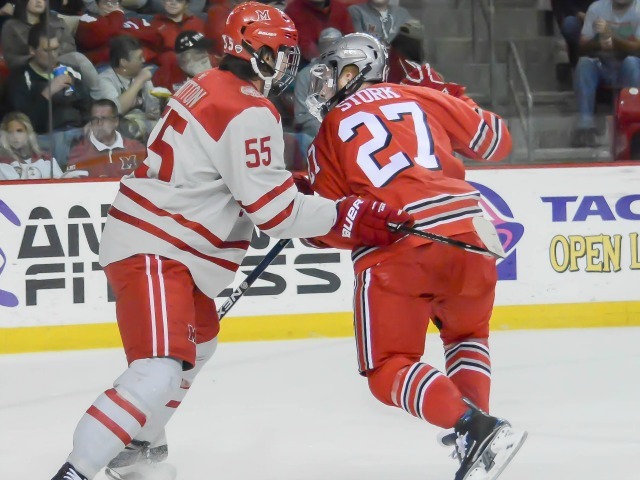 POSTSEASON RESULT: Swept by SCSU in first round of NCHC tournament. RINK (capacity): Lawson Ice Arena, Kalamazoo, Michigan (3,667). LAST SEASON VS. MIAMI: Nov. 6-7, Miami 2-1 and 2-1 in Oxford. Feb. 19-20, Miami 4-1, WMU 4-1 WMU in Kalamazoo. ALL-TIME SERIES: RedHawks leads, 65-58-11. SCHEDULE VS. MIAMI: In Kalamazoo Nov. 4-5. In Oxford Jan. 27-28. TOP RETURNING PLAYERS: So. F Griffin Molino, Sr. F Sheldon Dries, Sr. G Colin Conrad, Sr. D Chris Dienes. KEY NEW FACES: F Wade Allison/ Myrtle, Manitoba/ Tri-City Storm, USHL; F Lawton Courtnall/Los Angeles/Sioux Falls, USHL (son of NHL F Russ Courtnall). 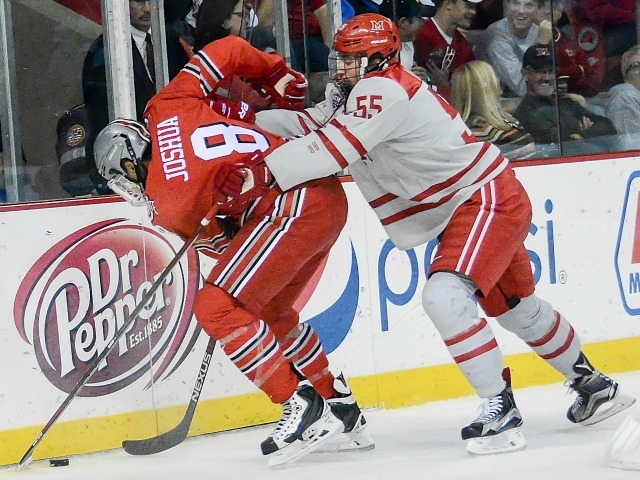 NOTES: WMU has finished seventh, seventh and fifth in the eight-team NCHC in three seasons. The Broncos only managed 80 goals last season, while allowing their opponents to light the lamp 142 times, including being outscored 59-28 in the middle period of games. Molino is the team’s top returning scorer with 25 points, including 11 goals, and Griffin was the leader on the team in assists (14). 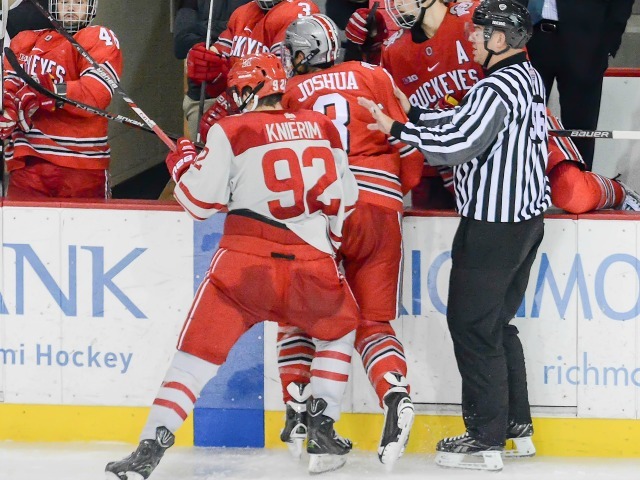 The defense corps is led by senior Chris Dienes, who played in all 36 games a season ago, while tallying one of the team’s two shorthanded goals. Dienes racked up 14 points on three goals and 11 assists from the blue line for the Broncos. Goalie Colin Conrad had season cut short due to injury after only seven starts while playing nine games (2-5, 4.15 GAA). 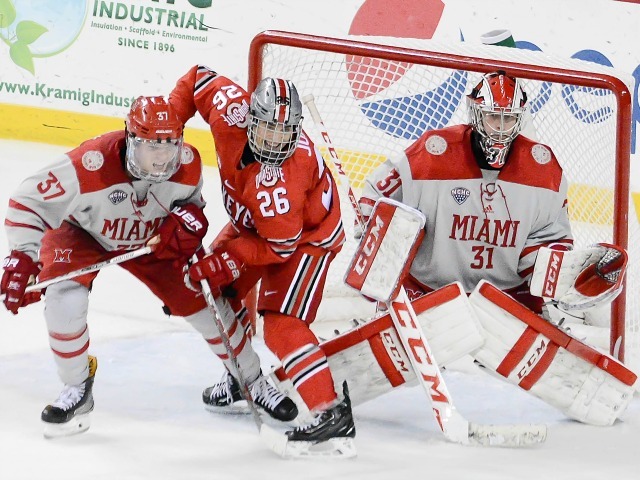 Conrad, an Ohio State transfer, did make career-high 36 saves in 2-1 loss at Miami on Nov. 6. The Broncos have added eight freshman, and WMU only has 12 upperclassmen. Western Michigan still only loses one of its top five point getters, missing forward Nolan LaPorte, who was tied for third in power-play goals with three. WMU is trending in the wrong direction, finishing seventh in back-to-back years in the NCHC. The Broncos are off to a rough start, falling in their pre-season game at home to Toronto. WMU will also need to play much better on the road this year, as nearly anything would be an improvement from its 1-17-2 record as the visitors.